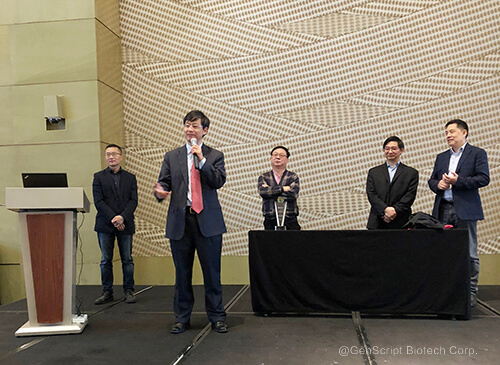 Piscataway, NJ (November 14, 2018): China Healthcare Summit 2018 hosted by BioCentury and BayHelix announced Dr. Frank Zhang, GenScript’s founder, as the winner of its Person of the Year Award. The goal of this award was to recognize an outstanding individual whose contributions have changed the landscape, reputation, and ecosystem of drug and/or medical technology R&D, deal transactions, and/or commercialization in China. After receiving the award, Frank said that he was surprised with the award as he knew many great entrepreneurs in his line of work and didn’t expect to be selected as the winner. In his acceptance speech, Frank mentioned three characteristics of GenScript upon which the selection committee might have chosen him. Frist, GenScript has helped many biotech start-ups to succeed. With more than 3000 employees, GenScript is now the largest biology CRO in China and provides a variety of enabling tools. From biology reagents to antibody drug discovery and development, GenScript’s services has helped biotech companies establish their technology platform, develop their products and achieve financial success. Second, GenScript has helped open the door to the world of Hong Kong IPO for China biotech companies. Since going public, the company’s stock price has increased by more than 10 fold and made many people excited about biotech. GenScript’s stock price has now become a good example of Hong Kong stock market, encouraging the development of biotech enterprise. Third, GenScript has set an excellent example on how to negotiate with big pharma in cross-border deals. The deal between Legend Biotech, a subsidiary of GenScript, with Janssen Pharma, is the first deal between the China biotech enterprise and a top pharmaceutical company. Through this deal in which Legend Biotech received 350 million dollars upfront for R&D investment, Legend was allowed access to shared market and received preferential interest. In his acceptance speech, Frank sincerely thanked all the people, including colleagues, customers, partners and investors, who helped him build and grow GenScript to where it is now. He said, "With this award, the GenScript team will work even harder to help make people and nature healthier through biotechnology". 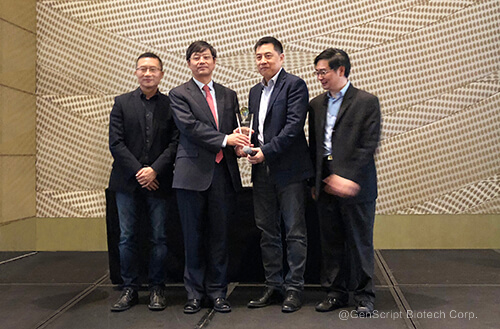 China Healthcare Summit has been organized for the last five years and previous awardees in this category were Dr. Samantha Du (founder of Zai), Ge Li (CEO and co- founder of WuXI AppTec) and Dr. Piao Yang Sun (Chairman of HenRrui Pharma). For more information about this award or GenScript, please contact Tracy Yin at Tracy.Yin@genscript.com. GenScript is the world leader in biotechnology reagent services and biologics. Established in 2002 in New Jersey, United States, the company was the first to commercialize gene synthesis and successfully establish fully integrated capabilities for custom peptide synthesis, protein expression and engineering, custom antibody development and engineering, in vitro/in vivo pharmacology as well as a variety of catalogue products. GenScript has now expanded its business into immunotherapy, CDMO, laboratory equipment, and microbial industry to further fulfill its mission in making people and nature healthier through biotechnology. GenScript has also established open and innovative technology-driven platforms and GMP facilities for pre-clinical drugs discovery and pharmaceutical products development.